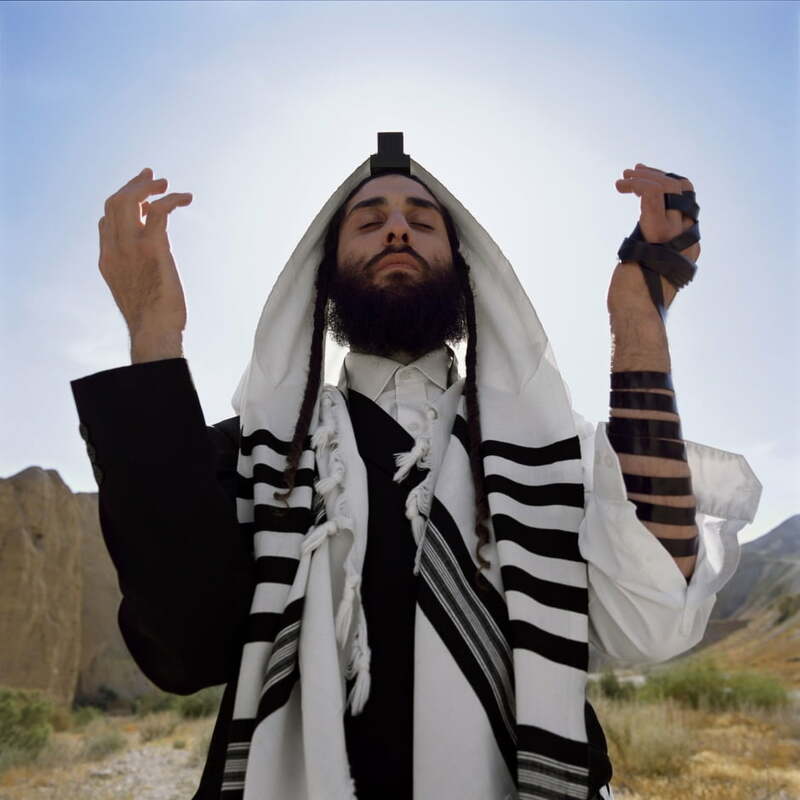 Isabel Rocamora’s Imaging Faith centres on Faith, a film triptych which intimately observes the act of worship of the three monotheistic religions in Jerusalem. 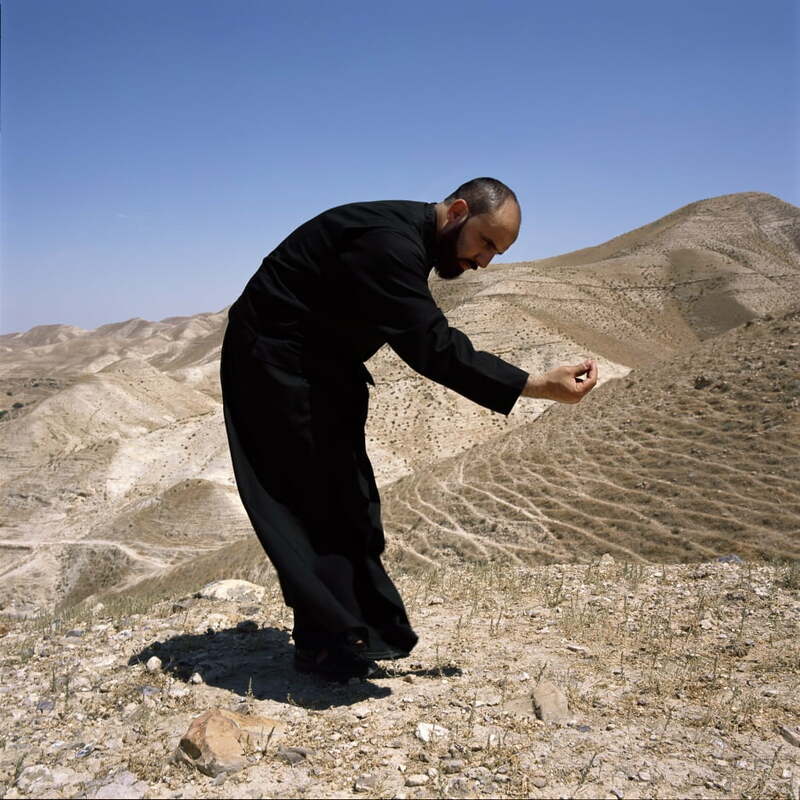 Set in the wilderness of the Holy Land – the historically significant landscapes of the Judean desert, far from the built and contested territories – an Orthodox Jew (Cohen descent), a Greek Orthodox Christian (Father, Church of Nativity) and a Sunni Muslim (Quran reader, Al Aqsa Mosque) perform their morning prayers. In time, their synchronous action reveals an uncanny similarity of inner state and gestural intention. Questioning segregation while celebrating difference, Faith contemplates issues of human belief, inviting reflection on one of the most tragic, world resonating conflicts that persist in this new century. 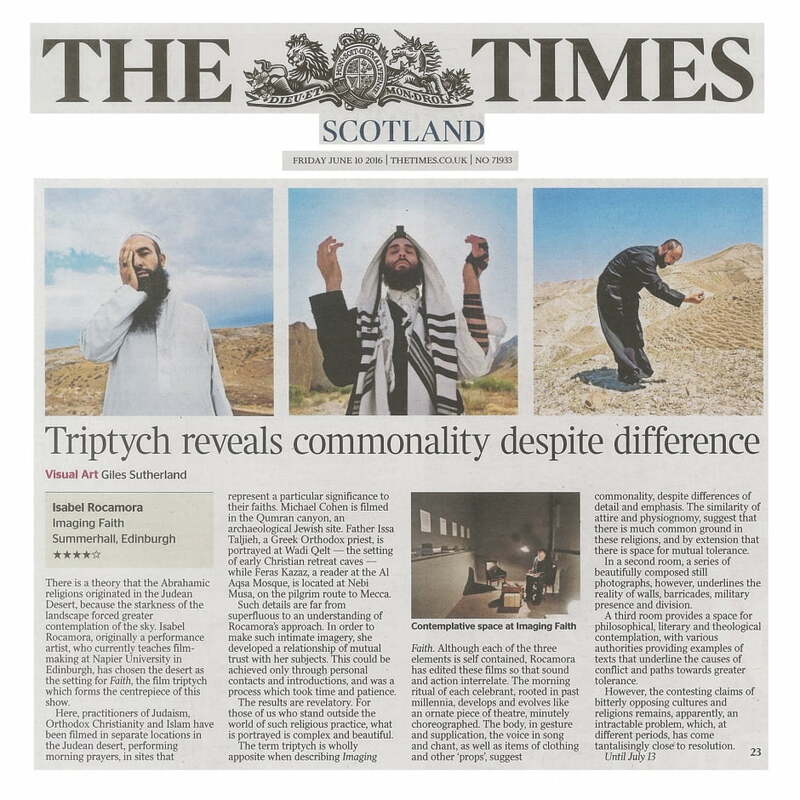 In the adjoining gallery a series of still images offer a window into Rocamora’s research in Jerusalem, culturally and politically contextualising the film triptych. A dedicated reading room provides a contemplative space in which six contemporary thinkers (historians, theologians and philosophers, including Gil Anidjar, Mark Cauchi, Victoria Rocamora and Simon Critchley) have been invited to curate passages from seminal texts in response to the themes of the exhibition. Rocamora is a British-Spanish artist whose films have been widely awarded and exhibited internationally. Recent shows include CCC Palazzo Strozzi, Florence; the National Museum of Photography, Copenhagen and the Bologna Museum of Modern Art. Imaging Faith presents the UK premiere of this new body of work by the Edinburgh-based artist as well as the first exhibition of her work in Scotland. Imaging Faith is produced by The Isabel Rocamora Studio in partnership with Summerhall. © Image by the artist, 2016. Courtesy of the artist and Galeria SENDA.